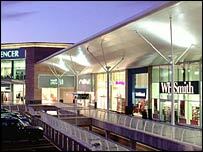 Another 600 car park spaces have been opened at a shopping centre which was forced to close over safety fears. The £200m Castlepoint Centre near Bournemouth in Dorset was closed on 1 December over concerns that the concrete in the car park was unsafe. About 1,600 of the total 2,975 car park spaces are now available but not all of the shops have been reopened. The centre was partially reopened on 20 December after structural work was carried out.